The intersection of Hollywood Boulevard and Highland Avenue is among the world’s most famous—you’ve seen it broadcast every year on the Oscars as the start of the red carpet. But like most celebrities, the tourist-thronged Los Angeles landmark had a very dark secret: It was known as one of the most dangerous intersections for pedestrians in LA. That all changed six months ago. Late last year, after the alarming news that pedestrian deaths were skyrocketing nationwide, several reports investigated Los Angeles’ most dangerous places to walk. Topping nearly every list was Hollywood and Highland, which is not just one of LA’s busiest for both people and cars, but also a place filled with people who are simply not paying attention—on both sides of the windshield. Not to mention the fact that the sidewalks are sometimes so crowded that people have no choice but to walk in the street. 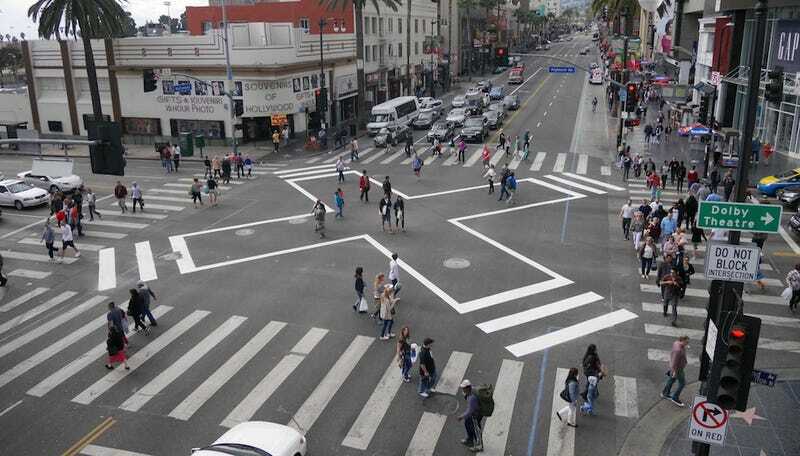 In November, LA’s Department of Transportation (LADOT) redesigned the intersection with a new “scramble” crosswalk (also known as a Barnes Dance). This kind of crosswalk design prevents crashes by separating pedestrians and drivers in time, meaning that vehicles are stopped in all directions while pedestrians get the intersection to themselves, then the cars get to take their turn. Marching diagonally across the street instead of waiting for two walk signals is a transcendent experience for pedestrians who are used to timidly scurrying across crosswalks. But the best news of all, at least for those behind the wheel, is that cars are also more efficiently routed through a scramble, due to the reduction of potential conflict when they’re trying to negotiate turns (which is when most crashes occur). Using a data-driven approach to fix dangerous intersections is part of LADOT’s Vision Zero initiative, part of a global trend to reduce traffic fatalities to zero. So LADOT works with LAPD to provide constantly updated provisional crash data to an open-data portal. From 2009 to 2013, the average number of crashes per year at Hollywood and Highland was 13. But since the crosswalk was redesigned in November, there has only been one crash. (LADOT had originally reported zero crashes, but after reviewing the data found a no-injury car vs. car crash that had occurred in March.) A closer look at the data also revealed this: In the first 11 months of 2015 there were 19 crashes, resulting in 13 injuries. Reducing that figure to a single non-injury crash over six months is impressive. So if this works so well, why not do it at every intersection? Well, price for one: LADOT estimates the cost for the conversion is about $100,000 per crosswalk. But beyond cost, the goal for each crosswalk in LA has to be considered separately. A scramble is the best solution for very high volume intersections, where there are lots of cars and people. But where pedestrian volume or budget doesn’t allow for a scramble, there are other changes that can be made. Better striping and pushing the curb out can help make walkers more visible. And signals can be programmed at no cost to create a Leading Pedestrian Interval (LPI), which brings some scramble benefits: It keeps the light red for vehicles in all directions while giving pedestrians a “head start” to cross the street before cars will try to make turns. The idea that such a simple change could have such unequivocal impact makes it seem like an obvious solution for busy streets, but the concept is only now seeing a revival in the US. The scramble has been used to great effect in large cities from London to Tokyo. But it’s not an easy sell in the US due to the perception that it exacerbates congestion—it was actually far more prevalent a half-century ago, before cities began prioritizing cars over people. In New York City, which is experiencing an epidemic in pedestrian deaths, there’s been a call for the city to re-install them on its most dangerous intersections. If the scramble proves effective it certainly would make sense to install more on Hollywood Boulevard, which is one of the few places in LA where pedestrians consistently outnumber cars. Of course, there’s an even smarter way to make a busy street for pedestrians safer: Close it to cars entirely.